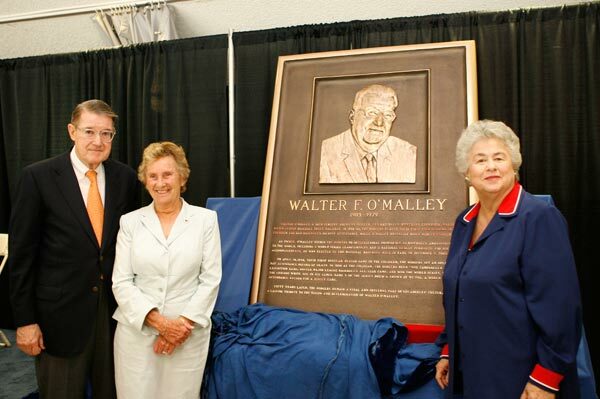 A bronze plaque commemorating the achievements of Walter F. O’Malley, one of sports' top visionaries and influential owner of the Dodgers, was unveiled July 9, 2008 in the prestigious “Coliseum Court of Honor” by the Los Angeles Coliseum Commission. 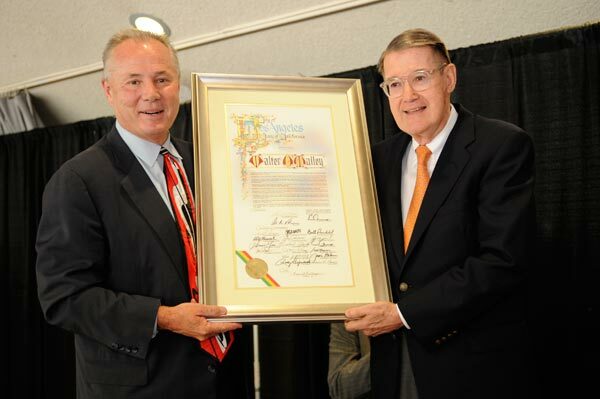 The City Council of Los Angeles also declared July 9, 2008 as “Walter O’Malley Day” in the City of Los Angeles and presented the O’Malley family with a proclamation. Speakers for the bronze plaque ceremonies, emceed by former Dodger broadcaster Ross Porter, included Dodger Hall of Fame broadcasters Vin Scully and Jaime Jarrin; former L.A. City Councilmember Roz Wyman (1953-65); former Dodger Manager and Hall of Famer Tommy Lasorda; Dodger star first baseman/outfielder Ron Fairly (1958-69); Terry O’Malley Seidler, daughter of Walter O’Malley; and Peter O’Malley, son of Walter O’Malley and former President, Los Angeles Dodgers from 1970-98. 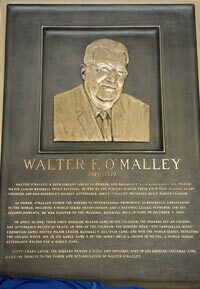 O’Malley, who built the most accomplished franchise in the modern era, established his legacy for expanding Major League Baseball’s borders westward, bringing the Dodgers to Los Angeles for the 1958 season and making baseball truly national. At that time, no major league team played west of Kansas City. Since 1998, 10 major league teams, or one-third, now play west of Kansas City. In addition, O’Malley’s crowning achievement was building, privately financing and influencing the design of Dodger Stadium, which opened in Los Angeles on April 10, 1962. He also built, privately financed and helped to design Holman Stadium at Dodgertown in Vero Beach, Florida in 1953. 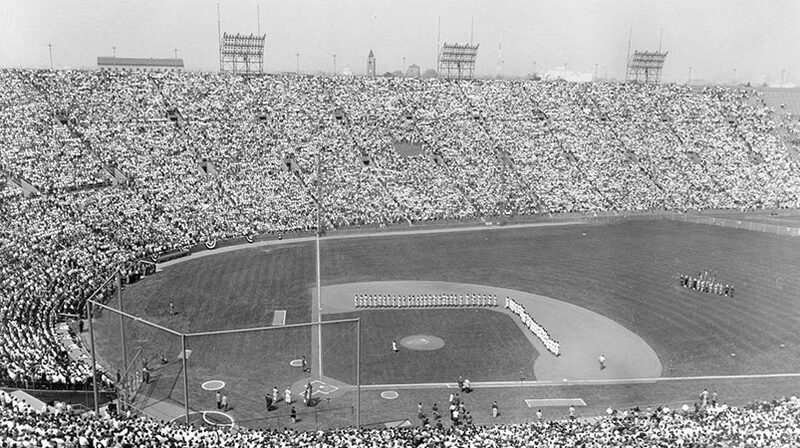 For their first four seasons (1958-61) in Los Angeles, the Dodgers played at the Los Angeles Memorial Coliseum. On April 18, 1958, the Dodgers played their first regular season game in the Coliseum and beat the San Francisco Giants, 6-5, before a major league record crowd of 78,672 fans who welcomed them to their new home. Family-friendly ticket prices established in 1958 at the Coliseum remained unchanged for 18 seasons (4 seasons, 1958-61, at Coliseum; 14 seasons, 1962-75, at Dodger Stadium). The Dodgers would struggle to a seventh-place finish in 1958, but became much more comfortable in their surroundings by 1959, rallying from seventh place to first (and a World Championship). In 1959 at the Coliseum, the Dodgers held the “Roy Campanella Night” exhibition game against the New York Yankees before a sellout crowd of 93,103 fans; hosted Major League Baseball’s second All-Star Game of the summer; and won the World Series, defeating the Chicago White Sox in six games. Games 3, 4 and 5 at the Coliseum each drew crowds in excess of 92,000, with Game 5 setting a World Series single-game attendance record of 92,706. The Dodgers’ 1959 World Championship played an integral role in the cultural growth of Los Angeles, coalescing all areas of the city. From 1958-61 at the Coliseum, the Dodgers drew 7,974,738 in home regular season attendance, tops in all Major League Baseball during that four-season span. In December 1999, ABC Sports Century panel ranked O’Malley 8th in its Top 10 Most Influential People “Off the Field” in sports history, while The Sporting News named him the “11th Most Powerful Person in Sports” over the last century. O’Malley served on Major League Baseball’s decision-making Executive Council for 28 years, the longest tenure ever of any owner. As owner of the Dodgers from 1950-79, O’Malley led an emblematic organization based on stability, success on the field and at the turnstiles. 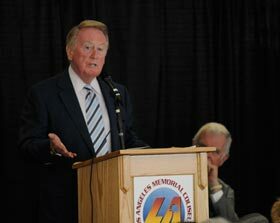 Under his leadership, the Dodgers won 11 National League Pennants and four World Championships (1955, 1959, 1963 and 1965). The Dodgers shattered and established attendance records and were the first team to draw three million home fans through the turnstiles in 1978. In 1956 and 1966, the Dodgers made two Goodwill Tours to Japan, with O’Malley advancing international baseball and making many other cultural exchanges. Peter O’Malley succeeded his father as Dodger President in 1970, while Walter O’Malley became Dodger Chairman of the Board until his passing in 1979. 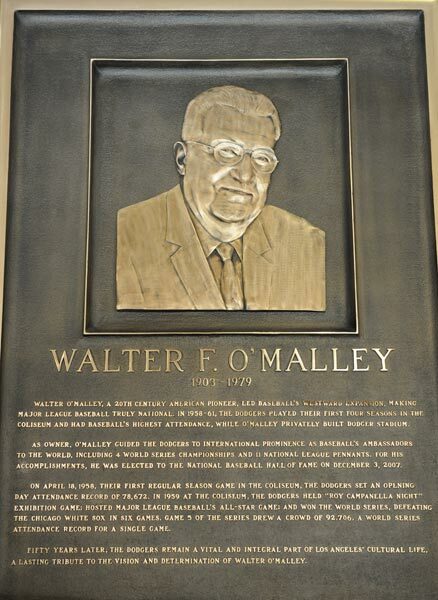 The combined O’Malley family legacy in baseball lasted for more than 50 years. Some other notables who have been recognized with the “Coliseum Court of Honor” include: Knute Rockne (1955); “Pop” Warner (1956); Baron Pierre de Coubertin (1958); “Babe” Didrickson (1961); President John F. Kennedy (1964); Amos Alonzo Stagg (1965); Cardinal McIntyre & Mary’s Hour (1966); Daniel Reeves (1972); Kenneth Washington (1972); Francis “Frank” Leahy (1974); Jesse Owens (1984); Pope John Paul II (1987); Pete Rozelle (1998); Jim Murray (1999); John McKay (2001); Jackie Robinson (2005); Vin Scully (2008); and John Wooden (2008). Click image for a larger viewPeter O’Malley, former President, Los Angeles Dodgers, 1970-98, and his sister Terry O’Malley Seidler stand to the left of the newly-unveiled bronze plaque dedicated to their father Walter F. O’Malley in the Los Angeles Memorial Coliseum “Court of Honor” on July 9, 2008. Rosalind Wyman (right) is the individual most responsible for encouraging the Dodgers to relocate to Los Angeles during her successful tenure as Los Angeles City Councilmember from 1953-65. 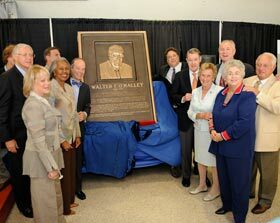 Click image for a larger viewThe Los Angeles Coliseum Commission unveiled a bronze plaque commemorating the numerous achievements of Walter F. O’Malley, the visionary owner of the Dodgers, whose decision to play in Los Angeles remains one of the most significant events in the history of Major League Baseball. From left-right: Coliseum Commissioner Candy Spelling; Los Angeles County Supervisor and Alternate Coliseum Commissioner Michael D. Antonovich; Los Angeles County Supervisor and Coliseum Commissioner Yvonne B. Burke; Coliseum Commissioner Barry Sanders; President, Coliseum Commission David Israel; Peter O’Malley, former President, Los Angeles Dodgers, 1970-98 and son of Walter F. O’Malley; Terry O’Malley Seidler, former owner, Los Angeles Dodgers and daughter of Walter F. O’Malley; Los Angeles City Councilmember Tom LaBonge; former Los Angeles City Councilmember Rosalind Wyman; and former Dodger Manager and Hall of Famer Tommy Lasorda. 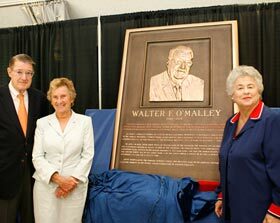 Click image for a larger viewThe bronze plaque honoring Walter F. O’Malley will be displayed in the Los Angeles Memorial Coliseum “Court of Honor”, located at the peristyle end. 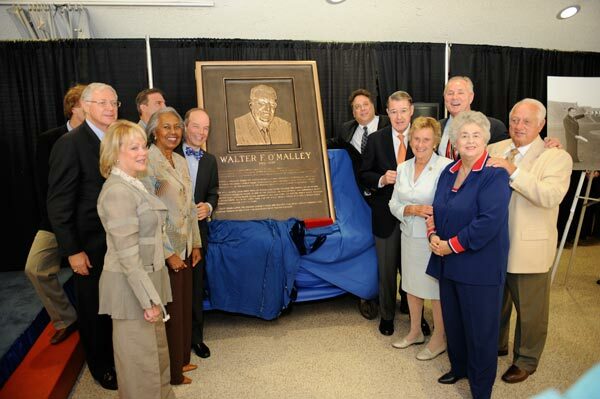 O’Malley’s bronze plaque is the 55th that the Coliseum Commission has awarded, joining a U.S. President, a Pope, world-class athletes, dignitaries and historic events. 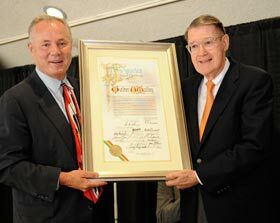 Click image for a larger viewLos Angeles City Councilmember, Fourth District, Tom LaBonge (left) presents a City Council resolution, making July 9, 2008 “Walter O’Malley Day” in the City of Los Angeles. The proclamation, received by Peter O’Malley, was signed by Mayor of Los Angeles Antonio Villaraigosa and all City Council members. Walter O’Malley, a 20th Century American pioneer, led baseball’s westward expansion, making Major League Baseball truly national. In 1958-61, the Dodgers played their first four seasons in the Coliseum and had baseball’s highest attendance, while O’Malley privately built Dodger Stadium. 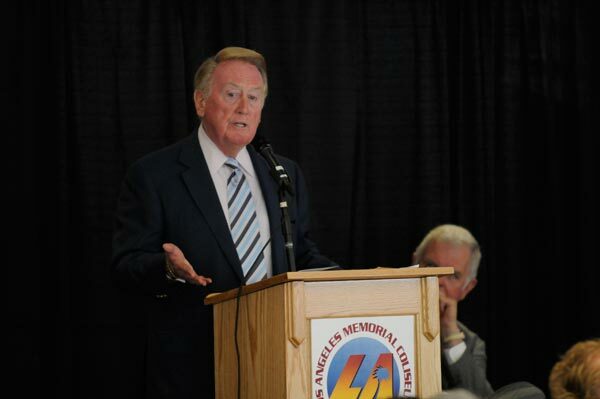 As owner, O’Malley guided the Dodgers to international prominence as baseball’s ambassadors to the world, including 4 World Series championships and 11 National League Pennants. For his accomplishments, he was elected to the National Baseball Hall of Fame on December 3, 2007. On April 18, 1958, their first regular season game in the Coliseum, the Dodgers set an Opening Day attendance record of 78,672. In 1959 at the Coliseum, the Dodgers held “Roy Campanella Night” exhibition game; hosted Major League Baseball’s All-Star Game; and won the World Series, defeating the Chicago White Sox in six games. Game 5 of the Series drew a crowd of 92,706, a World Series attendance record for a single game. Fifty years later, the Dodgers remain a vital and integral part of Los Angeles’ cultural life, a lasting tribute to the vision and determination of Walter O’Malley. Commemorating outstanding persons or events, athletic or otherwise, that have had a definite impact upon the history, glory and growth of the Los Angeles Memorial Coliseum.